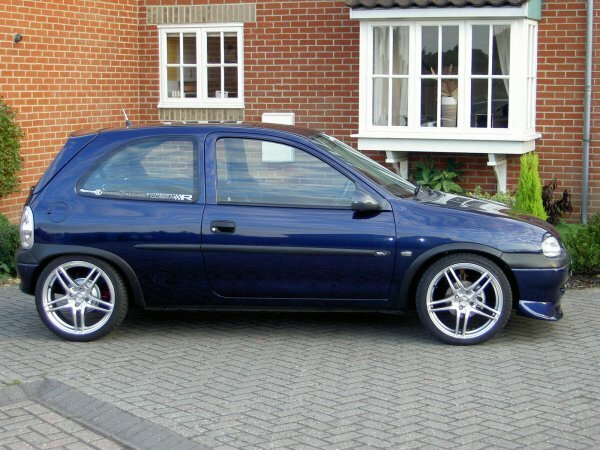 Corsa Sport » Message Board » Help Zone, Modification and ICE Advice » My car with my new wheels...opinions pls. Author My car with my new wheels...opinions pls. nice wheels mate, just outa interest whats it lowered by and what size wheels? whats next for it? i measured it against me mums and i think its only 20mm at the front but i doubt it and its 60mm at the back. the wheels are 16's. havin probs with em scrubbin tho. nice alloys, but i would lower the front of the car a bit more to eliminate that gap. yeah was thinkin about doin it but catches already. the camber and tracking needs doin aswell. Lookin' good man! I love that colour wheel. havin probs with em scrubbin tho. grind the bolts down mate that hold your arch on, and if its still doing it, grind some of the plastic away. i aint got the plastic arches on. its scrubbin on the metal underneath. not alot.. mit want pullin out a couple of mm. Is it catching the metal lip behind the plastic? If thats the case then you need to get the metal grinded down so you wheels no longer catch. yeah id had to do this on me nova. i want to get em rite up inside. i had though about gettin me wheels machined to make em nearer the 49 offset but aint sure. big gamble imo! dont get them machined, you'd be playing with fire there!!! It's the same colour as mine!! Shopuldn't have any rpobs with rubbin with 16s? wheels the correct Offset??? ET45??? if not this may cause scrubbing, and i say may because i aint sure, also no1 has suggested this so it is probly wrong, but then again it cud be right!! correct theyre et45, if it s just the back wheels rubbin then u cud always get the drums lathed...dont risk ur rims!! wheels are defo et45...have uniroyals on aswell which probably is the prob.